Not to be outdone by the small entrepreneurs and designers, London’s large retailers are all over the Royal Wedding souvenirs as well. When I was in London recently, I loved the collection John Lewis had on display. 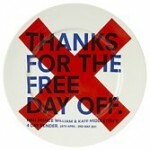 John Lewis, a large department store, had all the traditional items, but I liked the “alternative” items, like this “Thanks for the Free Day off” plate – which is a nod to the fact that a bank holiday was called for the 29th. And then there is the whole “It Should Have Been Me” movement – also marked by a commemorative plate. Just more ways to enjoy the day. I’ll be up super early tomorrow morning to catch every second of the big event. See the entire gallery of Royal Wedding items offered by John Lewis here. My grandmother had a drawer full of tea towels in her dining room. I don’t recall her ever using one, and to be honest, I am not quite sure what a tea towel is used for. However, I have seen some pretty elaborate ones in my day – not the least of which is this great tea towel designed by Emma Bridgewater to commemorate the Royal Wedding. 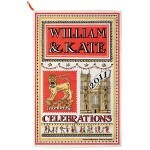 Ms. Bridgewater has designed this towel and several other items “to celebrate the most exciting event of 2011, the wedding of HRH Prince William to Kate Middleton.” I think it is a classy yet cool design – just perfect for this wedding. Find the Royal Wedding Tea Towel here. See all the cool items Emma Bridgewater offers here. Commemorative glassware – plates, glasses, etc. 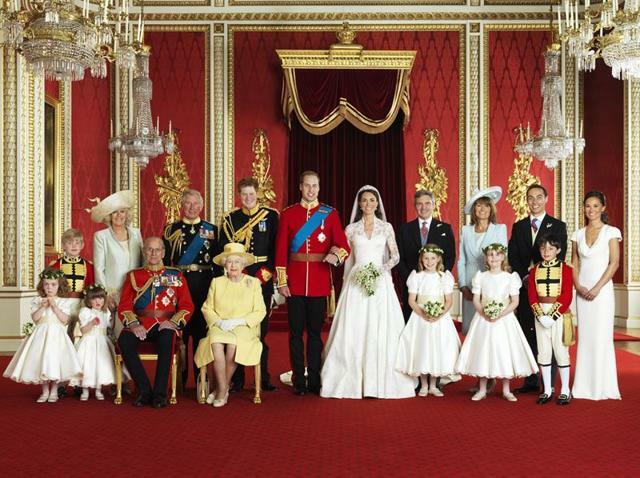 – are pretty common ways vendors help us mark the occasion of events like the Royal Wedding. I bought a few Royal Wedding china plates for all of my friends while I was in London last week. However, had I seen this mug from Cole of London first, I would have definitely purchased these instead. See the Kate and William Royal Wedding mug here. See Cole of London’s other mug designs here. One of the more interesting commemorations of the upcoming Royal Wedding is an exhibition of the wonderful works of artist Charlotte Cory. London’s Rebecca Hossack’s Art Gallery is hosting the Charlotte Cory: The Royal Wedding Street Party. 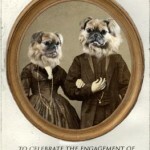 Cory’s unique works are a mash-up of Victorian-era formal photographs and taxidermied animals. Yep, that’s right. And to mark the occasion of the Royal Wedding, Ms. Cory works designed to honor William and Kate will be on display. Read more – and see more – about Charlotte Cory on her website. See more about The Royal Wedding Street Party exhibition here. We are getting into the Royal Wedding spirit by doing one of our favorite things… watching old movies. 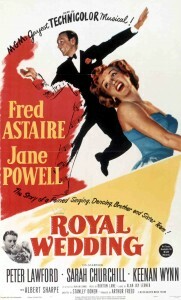 The are some great royal love stories that have been brought to the big screen, but the definitive Royal Wedding movie has to be, well, “Royal Wedding” – a 1951 musical starring Fred Astaire. Our friends at Turner Classic Movies have rolled it out a few times this month and it is just fun to see people in another era getting excited by another Royal Wedding. From the TCM synopsis: “As soon as brother and sister dance team Tom and Ellen Brown’s long-running Broadway show closes, they learn from their agent, Irving Klinger, that the show has been booked by his London-based brother Edgar to play at the Mayfair theater during the festivities surrounding the wedding of Princess Elizabeth.” And of course hijinks, hilarity and dancing ensues. “Royal Wedding,” which costars Jane Powell, in not Astaire’s finest film, but again, just a fun musical you wish were still being made. I think you can catch it on-demand on TCM if you have it. I am just back from my annual spring trip to London and I have Royal Wedding fever. I know I know. But it is great to have a feel-good event these days. Leading up to the wedding on April 29, I am going to feature a few posts about the wedding – and some interesting and curious items that have been created to commemorate the event. To kick it off, I have to comment on what I think is the best way to mark the occasion – knit the wedding party. 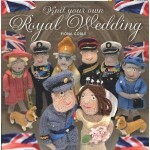 Yep, the book, Knit Your Own Royal Wedding, offers step-by-step instructions on how to knit miniature versions of Prince William, Kate and other members of the royal family. The knit version of the Queen includes a corgi and her ubiquitous purse – maybe now we can find out what she keeps in there. We love our vinyl here at Lost Cowboy. In fact, we are gearing up for a big new project centered around rediscovering the albums and singles we have packed away. So you can imagine how pleased we are to help celebrate Record Store Day. When I was a kid, one of my favorite places to hang out was an independent record shop where I was exposed to all sorts of new music and purchased most of my music. I also had the opportunity to sit around and talk about music with other like-minded kids. It was a great experience I wouldn’t trade in a million years for all the online music chat rooms. Anyway, there is still a record store culture out there (think “Empire Records”) but it is surely dying off. So Record Store Day is an attempt to recognize what is still there and shine the spotlight for just a little bit on these relics of a time gone by but still breathing. 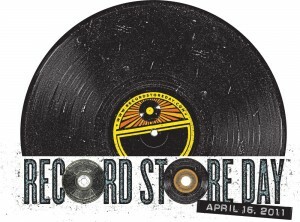 Visit the official Record Store Day website here. By now you have probably figured out that I come from a long line of collectors and hobbyists. One hobby that I dabbled in as a child, and never really had the patience for, is model making. My older brother loved making models from kits when were kids and he was really good at it. He followed directions well, and was good at the glue and the painting and had the patience to see a project through. I on the other hand, was too impatient to wait for the glue to dry and always skipped a view pieces to finish more quickly. I did have a fairly successful period of making buildings for my model trains, but most of my train towns looked like the wrong side of the tracks. So with these two things in mind (my need to finally control myself to complete and model project and the coming centennial remembrance of the Titanic disaster) I am setting out a challenge for myself. I am going to purchase a model kit of the Titanic with a goal to have it completed by the 100th anniversary one year from today. Thankfully, the good people at Revell produce an RMS Titanic Plastic Model Kit. I have just ordered my model from Amazon. I plan to start putting it together over the summer. What is the over/under on when and if I will complete this project within a year? * Boston’s Fenway Park opened the very same week in 1912. The 100th anniversary of that will be a big deal around these parts too. Tomorrow, April 14, 2011 will be the 99th anniversary of the sinking of the Titanic. We’ve had the 100th anniversary on our calendars for a while, and we will be looking for ways to count down the days leading to an inevitably disappointing commemoration next year. Anyway, there is no shortage of Titanic-related stuff out there. But one of the funniest and most irreverent things we have found (almost as good as the Titanic ice cube molds we highlighted last year = brilliant!) 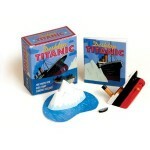 is the “Desktop Titanic: For When You Have that Sinking Feeling!” from Running Press. This is a great mix of popular and workplace culture and perfect for our 100th anniversary commemoration of the Titanic disaster. Lost Cowboy is powered by	WordPress 5.0.4 and delivered to you in 0.873 seconds using 60 queries.